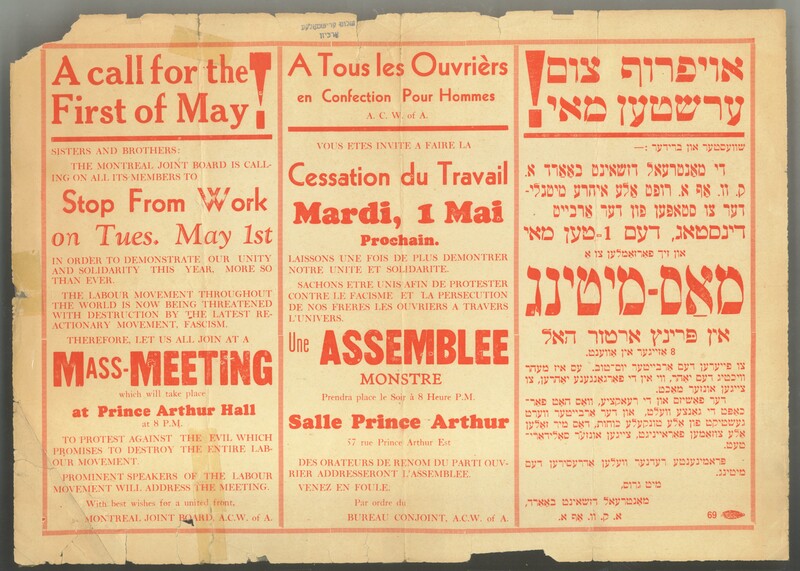 This poster, calling for mass meetings to protest European fascism on International Workers’ Day in French, English and Yiddish recalls Jewish activism on the political left, especially with regards to workers’ rights. The Archives is the caretaker of two hundred and fifty years of Canadian-Jewish history. As home to correspondence, manuscripts, photographs, and oral histories, the Archives preserves and makes accessible the cultural artifacts of Montreal’s diverse Jewish past. In collecting, organizing, and maintaining these materials, the Archives fulfills the JPL's commitment as "the trustee and curator of the cultural monuments of the people". The Archives was originally established to preserve the works of local Yiddish and Hebrew authors - the writers whose works lined the shelves of the Library. Through the hand-written poems of J.I. Segal or Ida Maze’s prolific correspondence, over a century of literary exchange and production is captured. The Archives has since expanded its scope to include any materials that document the social history of the community. One of the earliest documents of Jewish life in Quebec is a 1775 letter in which a Montreal fur trader, Richard Dobie, describes his unsuccessful attempts to buy wheat from a Jewish merchant during Passover. New waves of immigration brought distinct cultural, social and linguistic traditions to Montreal, all of which are reflected in the archival collections. The material chronicles the many fraternal, political, and philanthropic organizations that supported the community through social services such as affordable health care or interest-free loans. The Archives is the locus of peoples’ stories. The documents of well-known figures such as social activist Lea Roback, renowned impresario Sam Gesser or baseball legend Jackie Robinson reveal the personal narratives that shape the community’s social history. One thousand linear metres of textual material, 30,000 photographs, and over 250 posters are accessible to researchers online through specialized finding aids and personalized research services. Long an internationally renowned source of primary materials, the Archives has extended its reach out of the stacks and into the homes and schools of the people through use of digital technologies and participation in collaborative networks such as the Canadian Jewish Heritage Network (www.cjhn.ca). It is with this outreach that the Archives moves beyond its role as a curator to one of teacher.